In the middle of Lent the Church encourages us to look at our understanding of God with the parable of the prodigal son. It is Jesus teaching us what the Fathers love is really like.The Pharisees were complaining that Jesus did not obey the laws of keeping separate from sinners. Surely God does not want to get ʻcontaminatedʼ with sinners? What do you honestly think is Godʼs response to your sinfulness? 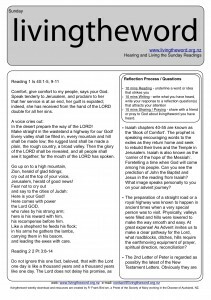 What ʻimageʼ do you have of God?